Grassy woodlands occupy only a small portion of the Greater Blue Mountains World Heritage Area, but their preference for rich fertile soils and their decimation through clearing elsewhere in the state makes them particularly important for the conservation of threatened species and ecological communities. Relative to the widespread shrubby forests on sandstone, the grassy woodlands are fringe communities in the Greater Blue Mountains. They occupy just over 2% of the landscape, occurring at both low and high altitudes on deeper soils of moderate to high fertility derived from shales and granites. 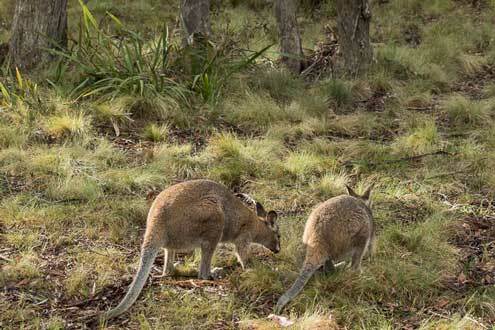 They occupy the rain shadows of both the coast and ranges. 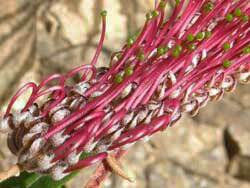 They have a diverse understorey of grasses and herbs, few shrubs, and their trees are often well-spaced. 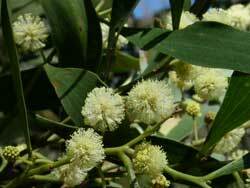 Canopy species include various box, red gum and ironbark eucalypts and, at high altitudes, species from the ash group of eucalypts. 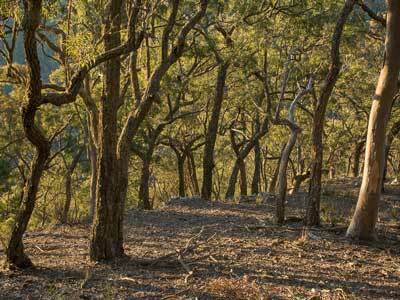 There are five classes of grassy woodland in the Greater Blue Mountains, each with quite limited occurrence. The Coastal Valley Grassy Woodlands in the Greater Blue Mountains occur at low altitudes in the valleys of the Wollondilly and Nattai Rivers and on the fringes of the Hunter Valley and Cumberland Plain. These locations are in the coastal rain shadow. Tall trees of Forest Red Gum (Eucalyptus tereticornis) are characteristic of these woodlands, as are Rough-barked Apple (Angophora floribunda) and Narrow-Leaved Ironbark (Eucalyptus crebra). 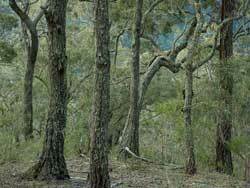 Subalpine Woodlands are found at the other end of the altitudinal spectrum, in the coldest parts of the Greater Blue Mountains, including on the Boyd Plateau and near Mount Werong in the southern part of Blue Mountains National Park. These woodlands are somewhat shorter than the coastal valley grassy woodlands. 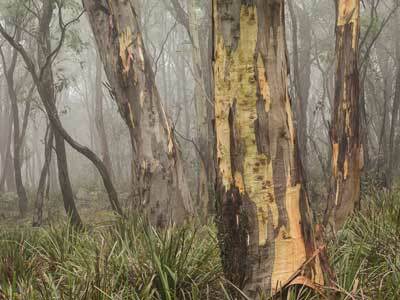 The main canopy species are Snow Gum (Eucalyptus pauciflora) and Mountain Gum (Eucalyptus dalrympleana). The ground cover is dominated by the Large Tussock Grass (Poa sieberiana). Tableland Clay Grassy Woodlands also occur at high altitudes; however, they are restricted to the richer soils derived from basalt. 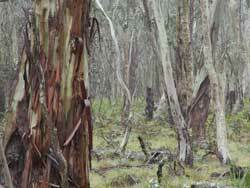 These woodlands support tall trees of Mountain Gum (Eucalyptus dalrympleana), Ribbon Gum (Eucalyptus viminalis), Yellow Box (Eucalyptus melliodora) and Blackwood (Acacia melanoxylon). In the Greater Blue Mountains, these woodlands are highly restricted, but they are more widespread elsewhere in NSW, occurring extensively on the Northern and Southern Tablelands. Examples can be found in the vicinity of Mount Werong and Wombeyan Caves. At lower altitudes, these subalpine and high-tableland woodlands are replaced by Southern Tableland Grassy Woodlands and Western Slopes Grassy Woodlands. The former grow on loamy soils in the rain shadow of the escarpment in the south-western part of the Greater Blue Mountains, south of Oberon. In the Greater Blue Mountains, the most prominent examples are the upper reaches of the Abercrombie River where the canopy species are mainly Broad-leaved Peppermint (Eucalyptus dives) and Apple Box (Eucalyptus bridgesiana). The latter occur in similar rain shadows north of Lithgow, including in the valleys of the Wolgan and Capertee Rivers and across northern Wollemi, where White Box (Eucalyptus albens) and Yellow Box (Eucalyptus melliodora) become prominent. Both these classes of grassy woodland are at the eastern-most limit of their range in the Greater Blue Mountains, and are more common west of the ranges. Shale/Sandstone Transition Forest (critically endangered) occurs in the lower mountains and White Box Yellow Box Blakely’s Red Gum Woodland (endangered) in the southern and western valleys. 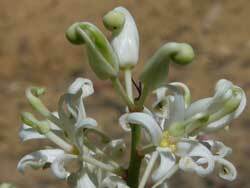 Its toothbrush-like flower and jagged leaves identifies it. This plant was found in the Kedumba Valley. A medium size tree - growing to 30 metres, it is identified by the 3-5 or more longitudinal veins on its leaves. This small shrub is recognised through the year by its unique leaves, and then in summer by its spikes of white flowers. This grassy community at about 1200m elevation features Mountain Gum (Eucalyptus dalrympleana, foreground) and Snow Gums (E. pauciflora), with a ground cover of Large Tussock Grass (Poa sieberiana), Lomandra sp. and Bracken Fern (Pteridium esculentum). This woodland in the Wild Dog Mountains (Blue Mountains National Park) is dominated by Narrow-leaved Ironbarks (Eucalyptus crebra). The sparse understorey and ground cover is typical of this vegetation class in the rainshadow areas of deep Blue Mountains valleys. This is a tiny but delightful example of a vegetation class that is mostly confined to low valleys in the east of the Blue Mountains. 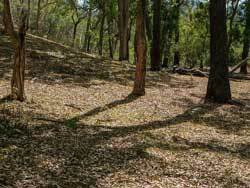 Here on a small alluvial flat in the rainshadowed depths of the Jenolan River gorge, Rough-barked Apples (Angophora floribunda) dominate over a marsupial-grazed ‘lawn’ and summer leaf-fall.